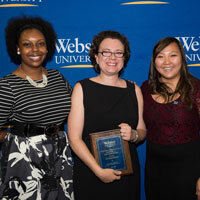 Students Brianna Lawson and Anna Gaffney presented Keller with the Student Organization Advisor Award. At the 23rd Annual Student Leadership Awards Ceremony held Sunday, April 17, in Grant Gymnasium, Bethany Keller, assistant director of the Multicultural Center and International student affairs department, was presented with the Student Organization Advisor Award for her work with the International Student Association. Comments from Keller's nominators referenced her dedication, passion and commitment in attending every event, meeting individually with members twice every semester, helping members to grow and develop into leaders, making herself available when help is needed. Additional nominations included, "She is a warm soul and someone that the members look up to" and "She thinks from the heart and is versatile and extremely helpful." The Student Organization Advisor Award is presented annually to the faculty or staff member who has done the most outstanding job as an advisor to help support their student organization in achieving their goals and contributing to the growth and learning of the student officers and members. Past recipients have included Mike Hulsizer, Pam Miller, Anne McIlhaney, John Ginsburg, Debbie Psihountas, Jennifer Stewart, Gary Ford, Larry Baden, JP Palmer, Victoria McMullen, Justin Barton, Megan Lucsko, Eric Goedereis, JB Kwon and Debra Carpenter. This year's nominees also included Jennifer Stewart, advisor to SGA and Commuter Council; Noriko Yuasa, advisor to AIGA (the American Institute of Graphic Arts student chapter); David Wilson, advisor to This Life Is Meaningful; and Corey Hawkins, advisor to AAAC (the Association for African American Collegians) and LGBTQ Alliance.